The maximum temperature on Sunday was 29.0ºC (84.2ºF) and the minimum 15.8ºC (60.4ºF). The maximum relative humidity was 89 per cent and the minimum 32 per cent. OUTLOOK FOR MONDAY: Partly Cloudy sky. Rainfall: Rain or snow has occurred at isolated places in Himachal Pradesh and Jammu and Kashmir. Weather was mainly dry in the rest of the region. Snowfall report in cms are: Himachal Pradesh: Dhundhi 4. Temperatures: Past 24 hours change: Maximum temperatures rose markedly in Jammu and Kashmir and Punjab, rose appreciably in Haryana, rose in Himachal Pradesh and Rajasthan and changed a little elsewhere. Departure: They were markedly above normal in Jammu and Kashmir, appreciably above normal in Jammu and Kashmir, appreciably above normal in Himachal Pradesh, Punjab and Rajasthan, below normal in Uttar Pradesh and normal in the rest of the region. The highest temperature in the region was 36.5C recorded at Banswara (Rajasthan). Past 24 hours change: Minimum temperatures fell in Jammu and Kahsmir and changed a little elsewhere. Departures: They were appreciably above normal in Himachal Pradesh and east Rajasthan, above normal in Haryana, Punjab and west Rajasthan and normal in the rest of the region. The lowest temperature in the plains was 12.7C recorded at Amritsar (Punjab). Forecast valid until the morning of March 18: Rain or snow is likely at isolated places in Himachal Pradesh, Jammu and Kahsmir and Uttaranchal. Weather will be mainly dry in the rest of the region. 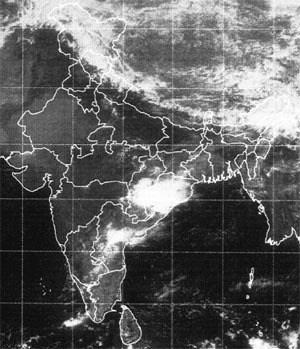 forecast for Delhi and neighbourhood valid until the morning of March 18: Partly cloudy sky. Rise in day and night temperatures. Maximum and minimum temperatures. Maximum and minimum temperatures will be around 32°C and 16°C, respectively. Farmers weather bulletin for Delhi: Forecast valid until the moring of March 18: Sky will be partly cloudy.